Toyota continues the arduous off road testing of the Toyota Tundra with “Killer Heat”, a television commercial showing the SUV driving through a tower of flames. The latest in a series of commercials, Killer Heat demonstrates the ability for the Tundra to keep transmission cool while towing large loads on steep slopes. In the Mojave desert temperatures can get quite high. 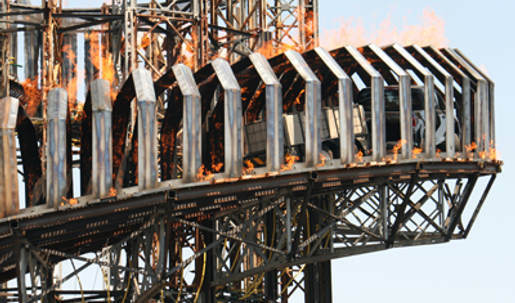 But Toyota’s marketing team pushed things further by commissioning a cork screw tower with flame grills installed. The commercial shows the end results of a process that created temperatures of up to 285 degrees Fahrenheit (140 degrees Celsius). The Toyota Tundra campaign was developed at Saatchi & Saatchi LA, Los Angeles, by executive creative director Harvey Marco, creative director Erich Funke, art director Peter Vattanatham, copywriter Lederman, director of integrated production/multimedia Damian Stevens, senior producer Jennifer Vogtmann. Filming was shot by director Andrew Douglas via Anonymous Content, Los Angeles, with executive producer Andy Traines, executive producer/head of commercials Dave Morrison, head of production Sue Ellen Clair, producer Aris McGarry and production supervisor Justine Madero. Editor was Robert Duffy at Spot Welders, with assistant editor Healy Snow, executive producer David Glean and editorial producer Carolina Wallace. VFX was done at MassMarket. Sound was designed at Noises Digital by Kim Christensen. Audio post was mixed by Loren Silver at Lime Studios, Santa Monica. See more on the commercial on How Stuff Works.